The business is run by Zac and Jesse Young. From this post on Cupcake Royale’s blog, it sounds like they’ve been in the smoked fish game for a few years. Young & Young’s instagram account provides the most clues clues as to what we can expect. Hillman City, a historic ’hood you’ve probably never heard of — about 300 yards south of Columbia City — gets much traffic on weekends now thanks to a dude who opened a Peruvian chicken shack in September. Big Chickie is a small counter with dozens of golden birds spinning on the rotisseries. Owner Matt Stubbs got the charcoal-fueled oven from Peru to give his chicken that distinctive open-flame aroma. Sitting in a short commercial strip, Big Chickie draws lines of working folks bringing home dinner on Friday evenings. On Saturday nights, many families with impatient kids wait for a table. Suddenly, at least on weekends, a small, forgotten ’hood seems to come alive. The menu: You see its name and you know to order chicken, right? Because if you’re a vegetarian, your consolation prize here is rice and beans. The short and simple menu features chicken and your choice of seven sides, along with cornbread muffins and two sauces. The chicken, your standard fryer, is marinated overnight in 15 different herbs and spices and lime. A whole chicken with two sides, four cornbread and sauces range from $22.49 to $25.99, depending on portion size of the side orders. Or order a half chicken with two sides ($12.56-$15.79), or just dark ($7.95) or white meat ($8.86). Sides options include steak fries, coleslaw, cheesy potato gratin, corn salad, kale slaw, lime-glazed sweet potatoes, yellow rice and black beans. Sauces are mustard-mayo mix and jalapeño-lime, though more options will be available soon. The citrusy, dark meat was succulent and even better with the charred skin on, a sweet and herbaceous bite. There’s a starchy, cheesy potato gratin that’s popular with the kids and a healthier side of kale slaw for adults. But mostly, the sides are unremarkable. What to skip: The breast meat can be a bit bland, which is where the citrusy, jalapeño sauce comes in handy. The setting: The shack is more designed for carryout orders, though there are a dozen Ikea-like tables and red folding chairs under a corrugated roof in the parking lot. What this will be like during the winter is anyone’s guess. The dining area is draped with vinyl curtains and the owner plans to install heaters. Summing up: A whole bird with two large sides, four cornbread muffins and the sauces totaled $25.75, enough to feed two. On just their first day open, Big Chickie officially sold out and the feedback throughout the neighborhood has been overwhelmingly positive. In addition to the buzz on Facebook and on the streets, Seattle Met wrote up a nice preview of the restaurant and the folks behind it. They’ve also got a nice slideshow of the new space. Click here to take a look at Seattle Met’s photos of the impressive renovation. …here’s a primer on what you might find here. Eat: Pollo a la brasa, Peru’s signature charcoal-roasted chicken. It’s all about the bird here—crisped-on-the outside, juicy-on-the-inside and crusted with herbs. And it’s a labor of love, first marinated overnight with citrus, garlic, herbs, and spices and then turned ever so slowly, basting in its own rendered fat, for over an hour in a wood-charcoal rotisserie. Customers can order a whole, half, or quarter chicken, served with sauces simply named “yellow creamy” and “green spicy”—that’s mayo-mustard and jalapeno respectively. Stubbs says the two creations are “like magic when they’re mixed.” The rotating cast of sides includes classics like steak fries, coleslaw, and corn salad, plus rice and beans and healthy options like kale slaw with edamame. Expect stuffing to show up on the menu around Thanksgiving. Drink: Draft beer and wine. What else would you need at a place with a cookout vibe? Sit: Outside. Most seating is on the covered, light-strung patio, which can be closed up and heated when the chilly months get here. It’s walk-up service only—no phone orders, no delivery—with the counter housed in the original service station building. As a nod to that past, Big Chickie is tricked out with neon signs and a menu on the wall reminiscent of gas-station window signages. There’s ample parking and it’s great for takeout (the roast chicken travels surprisingly well). Bonus Intel: The corner space where Big Chickie stands came with the condition that the original service station building be retained (to honor the memory of Rudy Hansen who owned and ran the service station for more than 40 years.) Thanks to some community crowdfunding and the folks at Hammer and Hand, the 1950s commercial structure was retrofitted and the surroundings revitalized. Just a heads-u p to everyone that the options for eating in the neighborhood have expanded. La Isla del Mojito, the new Latin place between 42nd and Brandon on Rainier, is up and running and already serving delicious food–it was a full house when we went there last Wednesday and the food was great. The owners of La Isla are also the owners of Grecian Delight, who narrowly made it out of their destroyed restaurant last week when an SUV plowed into it. They seem a bit shaken up, but excited to be focusing their efforts on a new project as the repair process moves forward (they were saying it could be around 6 months). Also to consider is Big Chickie, the new Pollo a la Brasa place just up the street from La Isla in Hillman City. They’ve had a few soft openings this weekend and the rumor is that the doors could be opening to the public as early as Monday today. Initial reports indicate that the food is delicious. Be sure to check out Big Chickie’s Facebook page for updates. Digging into some public records, it looks like there is the possibility of even more major building projects coming to Columbia City. One is 5201 Rainier Ave South, a triangle-shaped lot currently home to a tire/auto yard at 39th and Rainier, just south of Columbia City’s main business district. While there are some initial plans for this site dating back to 2007 (click here for an old PI article outlining those initial (and abandoned?) plans), it looks like there’s a new proposal that’s getting planned for a mixed use building (with a possible 6-story rezone). Besides this new site plan posted to Seattle.gov’s Permit and Property records, there’s not much to report. But, a major development between Columbia City and Hillman City is sure to attract a lot of attention and comment. 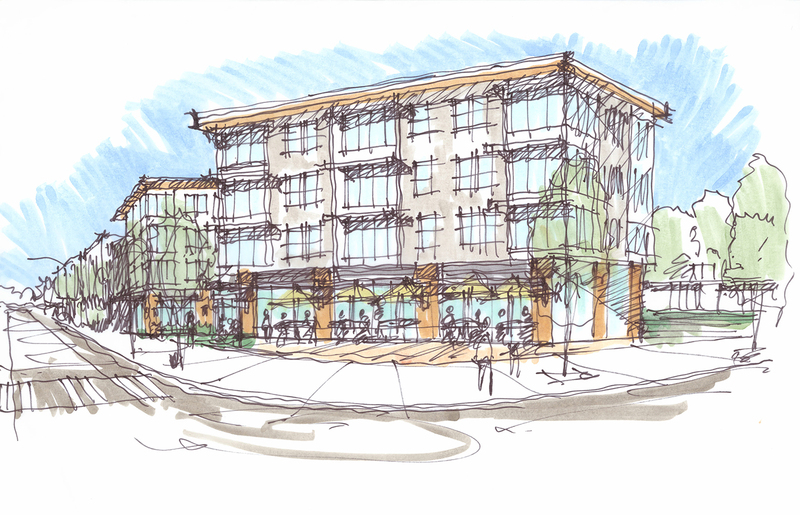 Another transit-oriented project could be coming to the Rainier Valley. Permit records show that Bellevue-based BDR Capital Partners is planning two buildings on either side of Martin Luther King Junior Way South at South Alaska Street. The site is near the Columbia City Link light rail stop. The four-story buildings would be on the northeast and northwest corners of the intersection, with a total of about 200 apartments. The project also includes 12,000 square feet of retail on the ground floor and about 165 underground parking spaces. NK Architects is designing the buildings. BDR has not picked a general contractor. Seattle Housing Authority owns the land and plans to sell it to BDR. Todd Bennett, president of BDR, said the sale will close early next year but he declined to give the price. BDR wants to start construction in 2015. The eastern building would start in June and the western building in December. Each should take about a year. Bennett said BDR is planning to have market-rate units only but hasn’t made a final decision. Click here for the full article (requires subscription). As always, consult Scott’s incredibly thorough Project and Development Map to see what’s planned for the greater Columbia City area. …Why does South Seattle undeniably lay title to the greatest hamlet in the Milky Way? The People! Everyone says it, so it sounds cliche, but I really think the people who live here and call South Seattle home are amazing! They all have amazing stories that are just as numerous and wonderful as the stars in the sky. The people I encounter here just blow my mind. A number of folks have pointed out that it appears Bookworm Exchange, the former Columbia City bookstore, is reopening in Hillman City. However, except for the new signage that went up on the corner of Rainier and Mead recently, details are very scarce. There’s no website, the last Facebook post is from the store’s closing in 2012, and no one I’ve spoken to knows any of the specifics. A preliminary search on Seattle’s building and business permits didn’t turn up anything for Bookworm prior to 2004. A quick glance in the window shows a lot of empty shelving–which suggests this might very well be a new storefront (and, say, not just an online operation). Does this mean Columbia/Hillman city is about to have two bookstores in the future? At this weekend’s movie in the park, I spoke with the manager of the PCC and he said Third Place Books is still very interested in pursuing the soon-to-be-former Seward Park PCC space as new location for the independent bookstore–complete with basement pub/cafe. If anyone has any more details or thoughts about either Bookworm or Third Place, be sure to chime in. Big Chickie specializes in charcoal roasted rotisserie chicken (also known as pollo a la brasa). Inspired by chicken BBQs the world over, we drew upon the pollerias of Peru, chicken joints on the East Coast, and roadside chicken BBQ stands to create Big Chickie. We hope that when you visit Big Chickie you’ll feel the joy of pulling up to that out of the way roadside chicken shack! We are under construction as you read this. We will be opening later this summer. Keep your fingers crossed that all of our remaining permits sail through inspection. We look forward to meeting you and serving you some pollo a la brasa soon! Thanks for your Big Support! We are off to a great start remodeling the old Rudy’s service station on the corner of Rainier and Findlay, but we need your help. Please check out the video that tells the story of the old gas station and why we need your support! Then, consider joining Hillman City Neighbors and friends in supporting this crowd funding campaign. Thank you, thank you, thank you to all the wonderful people who have already supported the crowd funding effort to landscape the property. You will be receiving your t-shirts or invites to the pre-opening festivities soon!